Provide an arena for raising awareness of national programme activities though national reports, sharing of experience and best practice, and for highlighting opportunities for collaboration between agencies. SCAGI continues to deliver a range of geographic information products through its various Products: Antarctic Digital Database (ADD); Air Operations Planning Maps; Composite Gazetteer of Antarctica (CGA) and SCAR MAP Catalogue. Usage statistics show that these SCAR Products are used and valued by the Antarctic Community. 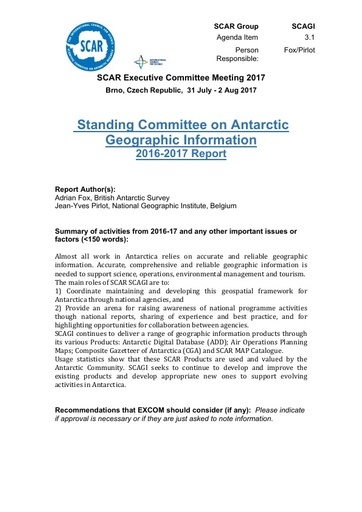 SCAGI seeks to continue to develop and improve the existing products and develop appropriate new ones to support evolving activities in Antarctica.